HOK led a 17-firm team that provided planning and design services for the rehabilitation and restoration of the airport’s historic 1941 terminal building. The improvements enhance the terminal’s functionality while making the travel experience easier and more enjoyable for passengers. The design preserves the historic Long Beach Airport terminal as an important part of the airport’s operations, with new structures appropriately scaled behind it. The landmark structure remains as the visual link between the landside and airside while serving as the main passenger circulation pathway for departing passengers. The symmetrical design of the airside garden area connects the north and south hold room buildings. Anchored by the historic terminal, a new “meeters and greeters” plaza is enclosed by a new passenger screening checkpoint building and covered walkways. “Set behind an Art Deco terminal dating from 1941 - by W. Horace Austin and Kenneth Wing, Sr. - is a range of crisp and cheerful new buildings by HOK that has brought this much-loved regional airport up to date without it losing its Bogart-Bacall-era Hollywood charm,” wrote the BBC’s Jonathan Glancey in naming the Long Beach Airport one of the world’s 10 most beautiful. The California Transportation Foundation gave the city of Long Beach its Aviation Project of the Year award for the new passenger terminal. “This award is validation of the hard work, ingenuity and planning that went into the airport’s new concourse and made it such a resounding success,” said Long Beach Mayor Bob Foster. The airport ranked among the best in the U.S. in Conde Nast Traveler’s Readers’ Choice Awards 2014. 45,900 sq. ft. / 4,250 sq. 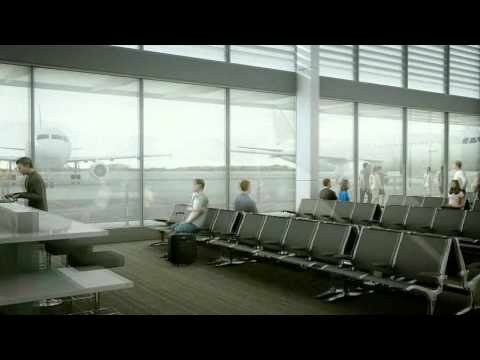 m.
Watch a YouTube video about the Long Beach Airport terminal modernization.